Unfortunately, the first seven miles out of Killarney were one of those portions of the route for which I didn’t have the detailed map. So I had no knowledge of the hills we might encounter. Ray assured us, though, that after that first hill it would be flat on the secondary road. Obviously, as I later discovered, he had never biked this road himself. Ray assured us also that it would be a nice day. I was dubious, because it looked like yet another overcast day. But he was a local, and I had confidence that he could read the tealeaves in the sky. I said goodbye to Simba, who raised an eyebrow in a startling demonstration of energy from his post on the hotel steps. I don’t think he’d moved since we’d arrived the day before. I was sort of wondering how he got food. 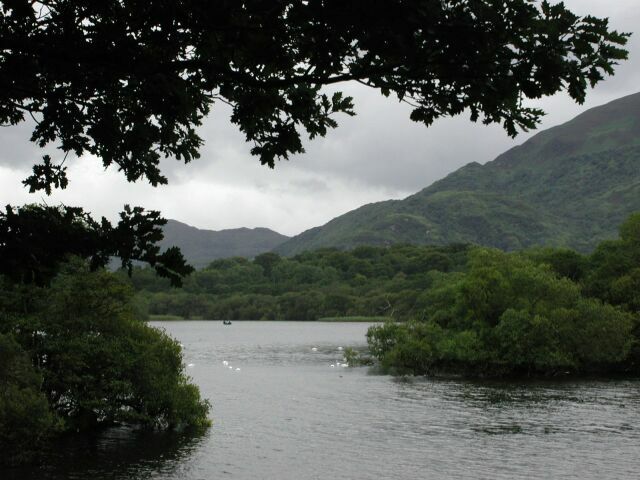 Lakes and mountains in a setting that is considered especially beautiful, even for Ireland, surround Killarney. We could sample some of that scenery now by biking down a side road about a mile to Ross Castle, which nestled against one of those lakes. As we cycled down the access road, I was chagrined to see housing developments lining the road. Box-like houses, American style, were going up in production-like fashion. I hated to see this defacement of the natural beauty of the area. We entered a park area, and I felt that small pride in cycling past the tollhouse where cars paid an admission fee -- it’s always special to arrive on a bike. We locked our bikes and walked up to the castle. The castle wasn’t opened yet for tours, but we were going to skip that anyway. If you’ve seen the inside of one castle, you’ve seen them all. And I’ve been through scores of them. After we had walked around the castle and taken lots of pictures, including this panoramic one, we looked for the path back to town that Ray had promised us. I always hate retracing my steps on a bike, so any alternative would have been promising. You can see in the picture that there is a little bridge on the extreme right that begins a footpath. Hopefully, this was what Ray meant, but we weren’t entirely sure. I had to lift my bike up the stairs to the little bridge. With the panniers and handlebar bag, the bike was surprisingly heavy and awkward. Well, not surprisingly, I guess. Sure was heavy, though. I wasn’t sure we were headed the right way, but the biking was really pleasant on the footpath. Vistas of the lake and castle were on our left, and there was freshness in the moist greenery that surrounded us. The surface of the path was asphalt somewhere down deep, but that was well covered with dirt, mud, and puddles. 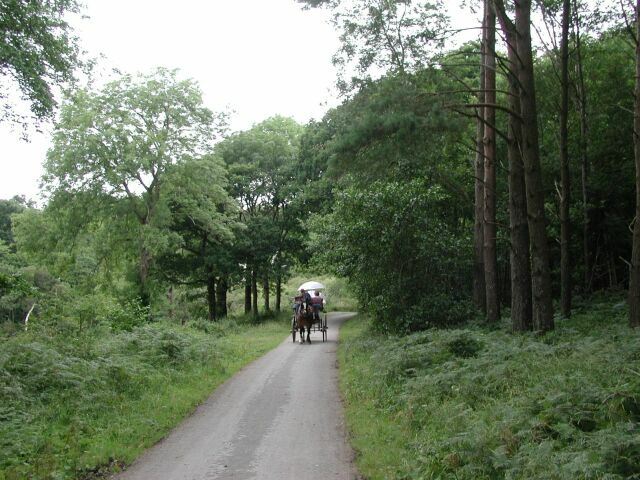 For quite a ways we saw no walkers or other cyclists, but there were a number of horse-drawn carriages that passed us. Each time we would have to pull off the path and stand in the wet grass as the carriage passed us. The guide would be saying to the passengers in a bored voice, “And on your right you see blankety-blank, which in 1438 was involved in such-and-such.” We would wave to the tourists, and they often seemed more interested in us than in the tour patter. One unfortunate consequence of the carriages was that the path was often splattered with droppings. I was glad that I wasn’t riding my own road bike with the narrow tires, and I was also glad to be able to ride through the occasional cleansing puddle. But that was a minor blot on the beautiful environment that surrounded us. This picture shows a view that could well have been from centuries ago – the footpath, a horse-drawn carriage, and the castle in the distance. It’s an idyllic scene. After about three miles we reached a fork where we followed the signpost back toward Killarney, and for another mile or so we saw quite a few people walking and pushing baby carriages. Finally we came out of the woods at a busy road in front of a cathedral. It was Sunday morning and the cathedral parking lot was filled. Ordinarily I would have paid some attention to the cathedral, but I hardly glanced at it as we took to the road out of town. Following Ray’s earlier directions, we negotiated two roundabouts (always a challenge on a bike), and joined the main road out of town towards Tralee. From there it was only about a half-mile to the turnoff for our secondary road, but that half-mile was a rather steep hill. I kept focusing on the approaching turnoff. Another hundred yards, I would tell myself. Puffing, I made the turnoff only to discover that the ensuing hill on the secondary road was even steeper. I gave up, feeling shamed, while Len biked ahead relentlessly. I walked up to the top, and this is the view of the hill. You can just make out the steeple of the large cathedral down in Killarney. Having reached this high point, I was relying on Ray’s assurance that the rest of the road would be flat. The elevation was something over 300 feet, and I watched the reading on my GPS as we biked along the empty road. I didn’t want the reading to go down, because that would undoubtedly mean having to climb again. The problem with hills to me is that the downhill goes so fast that it seems like I spend all the time climbing. But Ray was wrong. 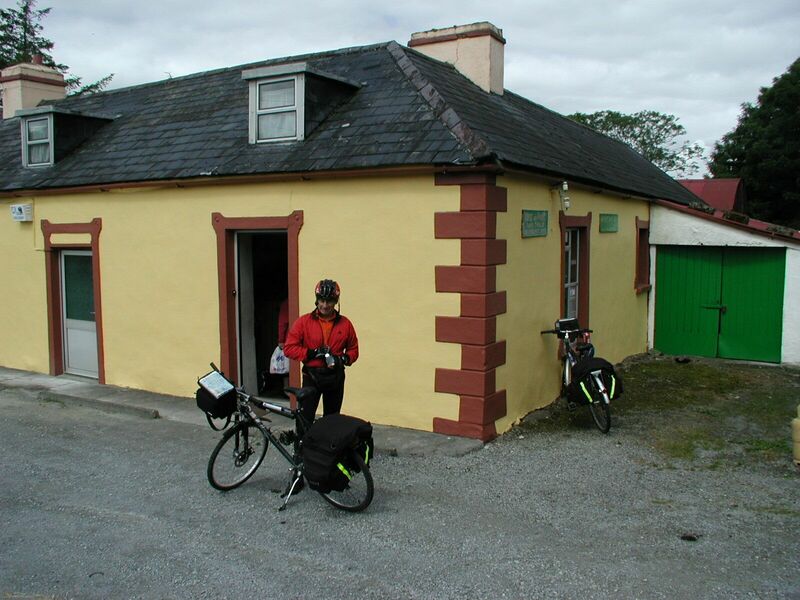 As we biked towards Tralee the road was as hilly as any we encountered on our trip. I hadn’t anticipated this, since I lacked the detailed maps for this area. For the most part the hills weren’t long, but they were occasionally steep. There was even one hill where Len had to walk, and that was the only time on the trip that he had to dismount. Just at the time he was beginning to wobble in his climb, a truck came over the top towards him. Whether he would have made it or not is conjecture, but Len felt that the truck finished him off. There weren’t any towns of any consequence whatsoever on this tiny road through farmland, and moreover it was a Sunday, so getting lunch presented a problem. We were approaching a town that at least was named on the detailed map, but there didn’t seem to be anything there at all. Len pulled into the driveway of a small building that didn’t look like a store. There was no sign, and I thought he simply needed to make an adjustment on his bike. But it was a post office, and incredibly, it was open. A very old woman was behind a grubby counter in the small room. I believe she may have been about 90 years old. I was embarrassed to have entered, because the supplies that she had were sadly pathetic. There were a few candy bars, and that was about it. Once there, however, I had to buy something, and I asked if there was anything to drink. She motioned towards a small, dirty refrigerator. Inside there were three cans of Coke. I bought one of them, and having done my duty, left. Outside, I worried about the woman. On the one hand, the whole thing was so pathetic. She couldn’t have made any money at all. On the other hand, I argued with myself that perhaps it was better for her to have the chance to meet the occasional customer than to sit in a rocking chair staring straight ahead all day. I just hoped that she had enough to get by. I still worry about her. As usual, it was hard to find a place to pull off to eat the meager lunch that we had accumulated. Eventually we pulled off in front of a wall that protected one of the isolated houses, and sat in the gravel -- hardly an idyllic scene now. I drank my coke, had a candy bar that I had saved, and ate a carrot and a peach from Len’s stock. Then we were back on the road. Soon afterwards, we encountered a strange sight. There was the slow clop-clop of a donkey approaching in the other lane. 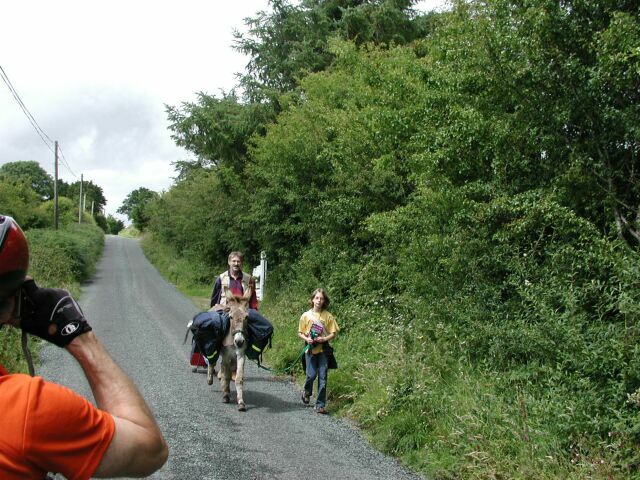 The donkey carried the panniers and provisions for what appeared to be a backpack tour by a man and a young girl, presumably his daughter. We stopped to take pictures and wave to them. I wish I had asked them about their trip. I’ll bet there’s a good story there. We were at least approaching the area for which I had detailed maps. I had planned a detour that would circumvent the large hill that had loomed in the distance. The detour would zig-zag around the hill, adding about four miles to our trip. As we turned off, I recall yet another dog, guarding the house at the intersection. This one ran after me, having been alerted by Len passing before. As always, however, this one veered off after having proved his abilities and bravery. On the way we passed many other dogs. Occasionally Len and I would call to them and say hello. Many of them were small dogs. They always looked alert and protective. I was thinking that there might have been more dogs than people in this country. Now we reached the zag portion of the zig-zag, and this was a prolonged hill. I made it up as it rose from sea level to a little over 300 feet in elevation. Somehow that doesn’t sound like much of a number, but for a comparison that someone from my neighborhood in New Jersey would understand, Tower Hill in Red Bank rises only 50 feet in elevation. This hill in Ireland, which was typical of many that we faced, was six times higher than the biggest hill in my usual neighborhood. Still it was only half as high as the hill that the detour was avoiding. 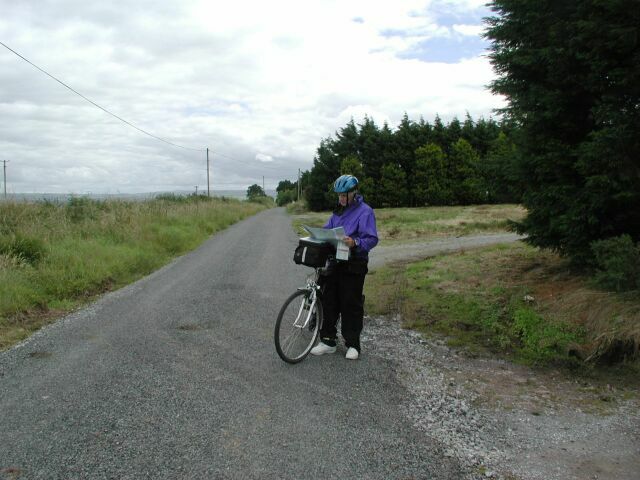 Here I am over the top of the hill in the familiar pose of studying the map. Now Which Way is Tralee? We navigated our way into Tralee via the back roads. Len was adept at finding approaches to the towns that would bring us directly to our hotels. He studied the detailed map, and told me that we would be going through two major intersections. Well, it was hard to find the “major” intersections. They turned out to be practically invisible dirt roads. We sometimes forgot that the detailed map was so detailed that we could be fooled into thinking things were bigger than they were. The last hills on the outskirts of Tralee were very tiring, but finally we were on a business road and immediately on our left was our hotel, the Brandon House. We hadn’t yet seen the town of Tralee itself. Len commented that this seemed to be a convention hotel, and apologized for booking it. It did lack for charm, but I was glad to get to a hot shower. More importantly, there was a bowl of fruit in my room, and I devoured the whole thing immediately. We locked our bikes in a storage building about a hundred yards from the hotel, and I lugged my stuff back to the desk. There was a small incident that rather typified our daily life on this trip. We got into the elevator to go up to our rooms on the sixth floor, but we stood perplexed in the elevator, because the buttons only went up to five. Len realized we were in the wrong wing of the hotel and got out. However, the doors started to close on me. I was holding the awkward, heavy panniers, had the handlebar bag draped over my shoulder, and was balancing my helmet with its delicate attached mirror. I reached to stop the closing door and everything fell in a heap on the floor as the door shut on me. Man, I was beat! While I was munching the fruit in my room I contemplated the day. In my planning this had been one of the two easiest days. It was relatively short – only about 27 miles – and had appeared relatively flat. 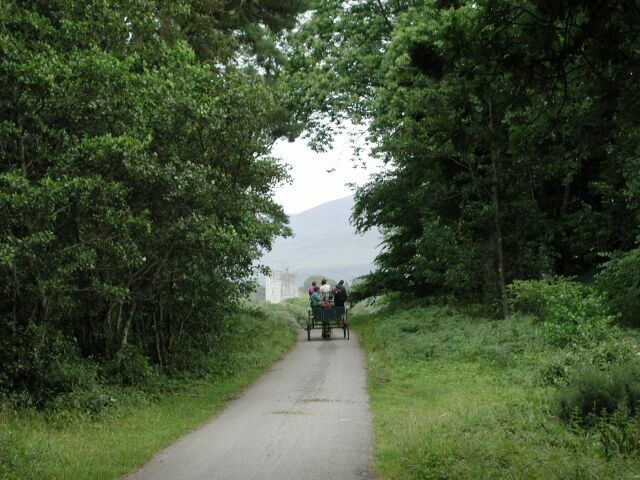 We had left Killarney early, but spent time at Ross Castle and on the footpath. Still, it hadn’t been late when we left Killarney, and we had hardly stopped for lunch. Even so, it had been 3:30pm when we had arrived at Tralee. Where had the day gone, and why hadn’t we made better time? I blamed this on having taken the secondary road, and also once again regretted the lack of complete coverage in my detailed maps. I felt that in the future we should stick more to the main roads, where I thought we could make better time. Our experience so far had been that there wasn’t much traffic between cities on the main roads, and that they were straighter, better paved, and less hilly. Moreover, they went through interesting towns along the way. In Killarney the night before we had been left with nothing to do between dinner and music time, so we agreed to leave the hotel later for dinner. We met in the lobby at 7:45pm and walked down the street towards town. It wasn’t obvious exactly where town started here as we searched for a main street. While we walked, Len called Stella on the cell phone and we took turns talking to her back in Los Angeles as we searched for a restaurant. 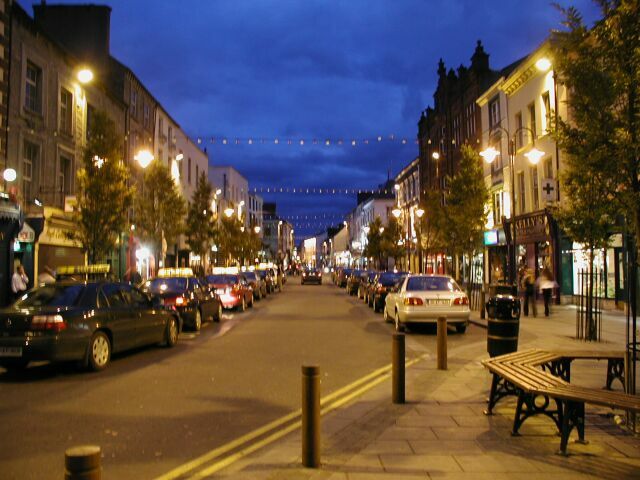 Tralee didn’t seem at first glance to be a particularly attractive town. 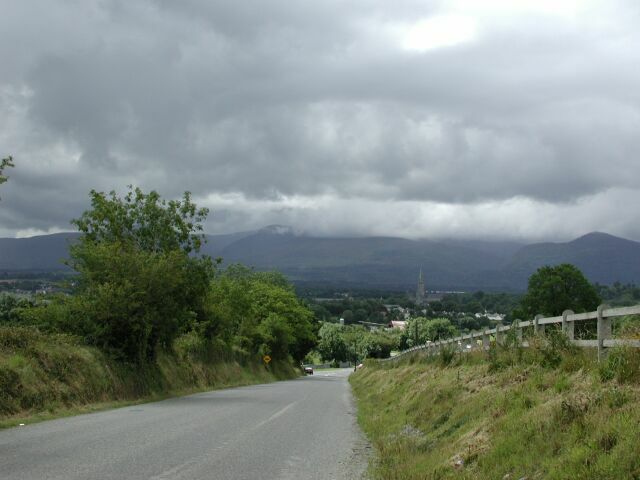 It certainly wasn’t as charming as Killarney, nor as authentically small-townish as Macroom. This seemed more like a working town with a dash of tourism thrown in. Every time I thought of it, I couldn’t get “Rose of Tralee” out of my mind. 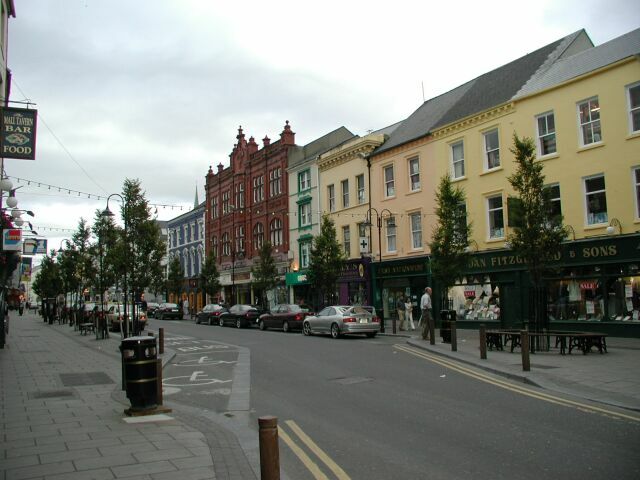 It was interesting that these very small towns in Ireland – Killarney, Tralee, and Galway – were so celebrated in folk songs known the world over. I couldn’t think of an equivalent in America. For a few minutes we sat in a large, crowded restaurant that resembled a Denny’s, but the menu was unappealing, and it didn’t look like we would get waited on, so we left, and on one of the side streets we found Val’s, a bistro where we were seated in an upstairs dining room. We each ordered duck, and we had our now customary half-bottle of red wine. Sometime later the waiter apologized – there was only one duck. Len let me have it and changed his order to something else. Sticky toffee pudding was on the desert menu, and I couldn’t resist ordering it. Not only had this been delicious in Macroom, but also I loved the name. Unfortunately, the Tralee version wasn’t as good as I had remembered. After dinner we went out in search of traditional music. Several passers-by told us that Og’s was the best bet, and there we found a six-piece traditional Irish band. 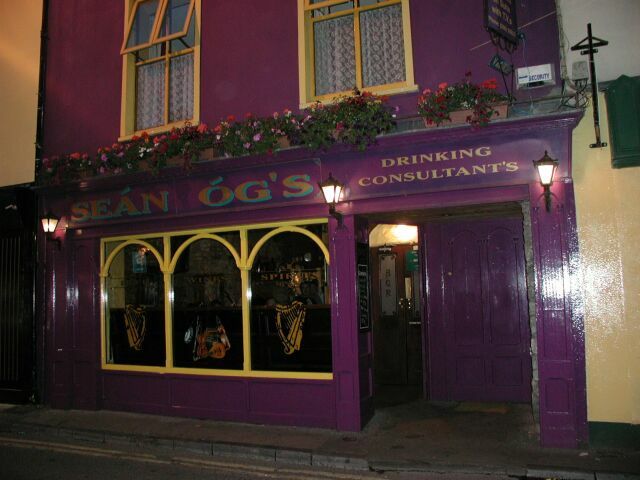 I loved the “Drinking Consultants” over the door at Og’s. But we weren’t crazy about the music being played. Len and I were learning, and one thing that was slowly seeping into our resistant minds was that “traditional” music meant instrumental music. This was guitars, banjos, a fiddle, and sometimes a form of bagpipe where the air pressure was supplied by squeezing the bag between the player’s upper arm and his body. It was ok music, but after a while it had a sameness to me. I liked it when it was a dance or jig, but more of the time it was just, well, fiddling and plucking. What can I say? Len was looking for a chance to request a song, and when the bandleader got up to get a drink, Len approached him, asking if he could sing a ballad. “Ah, Jesus, no!” he replied, seemingly affronted. Afterwards, Len and I kept repeating this phrase with his note of astonishment. I think this was the moment when we decided that asking for traditional music wasn’t the right thing for us to do in the future. We walked to some other pubs along the main street, but they were all rock bands. Even though it was a Sunday night, Tralee was rocking. Nevertheless, we decided to call it an early night. It did me no good, however, as outside my window there was a clamor of loud voices, which went on keeping me awake until all the hub-bub suddenly ceased at exactly 2:00am. This same thing happened in several other towns. It must be that the pubs close at 2:00am, but I never verified this from personal experience.